Hello Scrapping Cottage friends! Thanks for taking the time to stop and visit with us today. It's Mary Marsh here bringing you the Saturday edition of the Blog. Before I start with today's card, I wanted to let you know we have a new release of dies. It's our Rise & Shine collection and they are currently on a 25% sale. To see some card samples from the team - click here and here. Today, I am showing a card from our Spring die collection. I still need a few more Easter cards and I wanted to create one using the Happy Easter Phrase die. So lets get started with the details on how I created my card. Step 1: I had this idea brewing in my head for awhile about sponging a sunrise with hills, the cross and the Easter Phrase. I wasn't real sure of how I was going to accomplish all of this but I think it worked out well the way I created my card. I started by sponging my white cardstock with distress inks. I used hello honey, abandoned coral oxide and wilted violet oxide. I just purchased a few of these oxide inks and they sponge on so smoothly. I really like them. Now I can see why the team loves them so. Card Panel: 3 7/8" x 5 1/8"
Step 2: I was going to create a slope for my hill and then I decided to use the rock die from the "under the sea" collection. I cut two of them with some soft suede patterned paper. I re-sized them by cutting off of the bottom to create my hills. Just another way to get more mileage out of the dies that you already own. Step 3: Now for the cross, I just used a stamp I had in my collection and stamped with the help of my MISTI in soft suede ink. I centered the cross in between the slops of the hills. Attached the hills to the sponged sunrise panel. Sponged a bit more of the coral and violet inks to get the color a bit more vibrant. Step 4: The Happy Easter phrase was just a bit to big to fit this panel so I snipped off the Happy part. Just the word Easter seemed to fit the sunrise background I created. Step 5: I wanted to layer this image panel on a violet background but I had no cardstock that color. So I took a piece of white cardstock and sponged the outer edges with the wilted violet oxide ink. Now I had the perfect color panel. Attached to the image panel and then attached to my coral card base. Violet Layering Panel: 5 1/8" x 3 7/8"
Coral Card Base: 5 1/2" x 4 1/4"
Step 6: I decided to do a little finish work on the inside of this card. 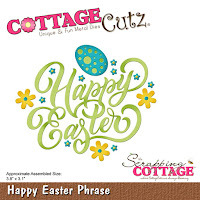 I added several eggs and some of the flowers that are part of the Happy Easter Phrase die. Well, that's it for me for this week. I hope I have given you an idea on another way to use the Happy Easter Phrase die on a card. See you next Saturday! Gorgeous sky for your cross! Lovely Easter card! This is just lovely, Mary. I love the way you created the sky for Easter morning. Beautiful! I like the background. WOW Mary! This is just beautiful! Love the background and the simplicity! What a lovely backround! You made such an elegant card.